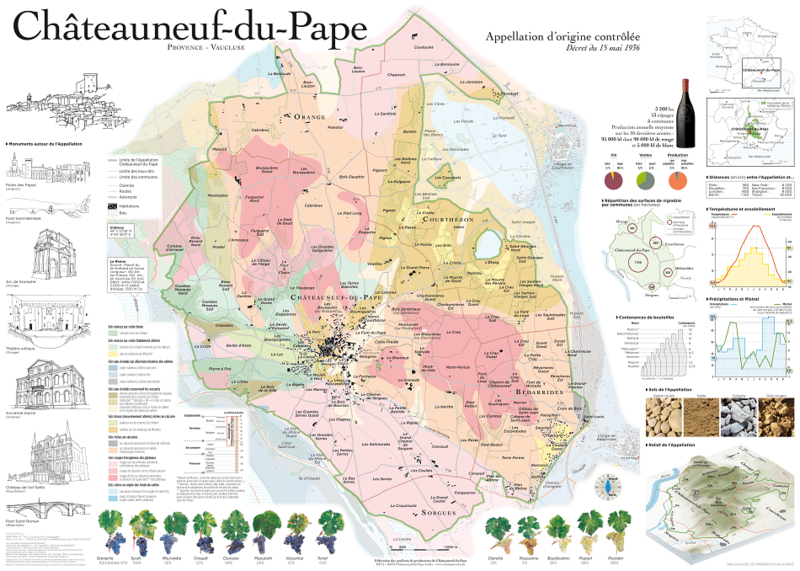 For plenty of information about the Châteauneuf-du-Pape appellation and the “GSM” grape blend, please refer to our previous post about Châteauneuf-du-Pape. Regarding Cinsaut, a grape that is part of the Chante Cigale blend beside the GSM trio, this is a black-berried grape variety originating from southern France, probably from the Languedoc-Roussillon area. Its earliest documented mention dates back to 1600 under its old synonym “Marroquin“; later on (1829) it was referred to as “Sinsâou” and finally by 1888 it took its current name of Cinsaut. Cinsaut has also been known and cultivated in Italy since the XVII century (both in Sicily under the name “Grecaù” and in Puglia under the name “Ottavianello“) and in Spain under the name “Sinsó“. Notably, Cinsaut was also used in South Africa to breed the Pinotage variety (a cross between Pinot Noir and Cinsaut, the latter erroneously referred to as “Hermitage” in South Africa). Cinsaut finds optimal conditions in southern Frances’s warm and dry soils, where it produces red wines that are generally smooth, fruity and aromatic and it often serves as a blending partner. Cinsaut also makes pleasantly fresh and perfumed rosé wines. In 2009, total plantings of Cinsaut in France were 20,800 HA, mainly in the Languedoc-Roussillon and Provence-Côte d’Azur districts, as well as in Châteauneuf-du-Pape, where it may serve as a minority blending partner in the local red. The country with the second largest Cinsaut plantings after France is South Africa, with 2,241 HA in 2008. In Italy, total plantings in 2000 were a mere 288 HA, mostly in the Puglia region (particularly in the Ostuni DOC territory) under the synonym Ottavianello. Cinsaut is also cultivated in Morocco and Lebanon, as well as in California that in 2008 had just 47 HA. The history of Domaine Chante Cigale starts in 1874, when the then owner Mr Hyppolite Jourdan named his 28 HA estate “Clos Chante Cigale” (meaning, “vineyard of the singing cricket”). The name of the estate was then changed to the current “Domaine Chante Cigale” in 1936, when its wines earned the AOC appellation. Currently, the wine is made from a blend of 65% Grenache, 20% Syrah, 10% Mourvedre and 5% Cinsaut grapes that grow in 33 HA of vineyards on a soil that is a mix of limestone, sand and pebbles. Grapevine density ranges from 2,500 to 4,500 vines/HA and the average age of the vines is 45 years. Total production is 120,000 bottles per year. The wine that we are going to review today is Domaine Chante Cigale, Châteauneuf-du-Pape AOC, 2009. The wine was a whopping 15% ABV and the proportions of the blend were 65% Grenache, 20% Syrah, 10% Mourvédre and 5% Cinsaut (for more information about those grape varieties, check out our Grape Variety Archive). In the U.S. it retails for about $35. The grapes underwent a 5-day prefermentative cold maceration phase at 50F/10C, followed by a 28 to 35 day fermentation and maceration phase with punch-downs and pump-overs. The wine then aged for 15 to 18 months 70% in concrete vats and 30% in new oak barrels. On the nose, its bouquet was intense, complex and fine, presenting an impressive kaleidoscope of aromas: tart cherry, black currant, wild berries, violet, cocoa, wet soil, leather, sweet tobacco, rosemary, vanilla, licorice, black pepper, forest floor and a barnyard note. In the mouth, the wine was dry, had high ABV, and was smooth; it was still moderately acidic, moderately tannic and tasty. It was full bodied and balanced, with intense and fine mouth flavors of tart cherry, wild berries, dark chocolate, licorice, rosemary and a peppery note. It had a medium finish and its evolutionary state was ready approaching maturity, meaning great to be enjoyed now but suitable to be kept in the cellar for not more than a couple more years. Overall, Gaja’s 1967 Barbaresco was a spectacular treat to taste after 48 years of aging: a true testament to the longevity and age-worthiness of a wonderful, albeit difficult, grape variety such as Nebbiolo. Even after so many years spent in the bottle, the wine was still an outstanding performer and still retained much of its fruity aromas and flavors and enough acidity to keep it alive and kicking. It was wonderfully evolved, with a complex aromatic profile (ripe cherry, dried roses, sweet tobacco, cigar box, cocoa, soil, forest floor and mineral hints), great flavors and sapidity and a long, lingering finish: an amazing experience. Nebbiolo is without a doubt Piemonte’s most world-famous black-berried grape variety. Researchers have recently been able to trace back the origins of (or at least the first documented reference to) Nebbiolo to 1266, at which time the grape was called Nibiol. This makes Nebbiolo one of the oldest grape varieties in Piemonte. While Nebbiolo is definitely an Italian indigenous variety, doubts still remain as to whether it originated from Piemonte or Valtellina (a mountainous district in the neighboring region of Lombardia, where Nebbiolo is still grown nowadays and locally known as Chiavennasca – pronounced “key-a-vennasca“). The name Nebbiolo comes from the Italian word “nebbia” (fog) – some say because of the fog that in late Fall generally enshrines Piemonte’s hills where Nebbiolo is grown. Nowadays, three main different Nebbiolo clones have been identified: (i) Nebbiolo Lampia; (ii) Nebbiolo Michet; and (iii) Nebbiolo Rosé. Interestingly enough, however, DNA profiling has shown that, while Lampia and Michet have identical DNA profiles, Rosé does not share the same profile, which has recently led to consider Nebbiolo Rosé a different grape variety altogether rather than a clone of Nebbiolo. Nebbiolo is a late-ripening, very finicky variety in terms of the terroir it requires to produce quality wine, which means that Nebbiolo successfully grows only in very few places on the face of the earth – Piemonte and Valtellina sure being two of them, along with certain of California’s AVA’s. Nebbiolo grapes generally have robust tannins and high acidity, which make it a variety that is very suitable for long-term aging. In Italy, Nebbiolo’s best expressions occur in the northern regions of Piemonte and Lombardia. More specifically, in Piemonte these include outstanding varietal wines such as those produced in the well-known Barolo DOCG and Barbaresco DOCG appellations (which encompass different territories adjacent to the town of Cuneo) as well as non-varietal wines in the lesser known but also solid appellations Gattinara DOCG, (which requires for its wines 90% or more Nebbiolo grapes), Ghemme DOCG (which requires for its wines 85% or more Nebbiolo grapes) and Boca DOC (which requires for its wines 70% to 90% Nebbiolo grapes), which all encompass different areas adjacent to the town of Novara, where Nebbiolo is locally known as “Spanna“. In Lombardia, outstanding varietal Nebbiolo wines can be found in the Valtellina Superiore DOCG and Sforzato della Valtellina DOCG appellations in Lombardia’s mountainous Valtellina district (where Nebbiolo is locally known as “Chiavennasca“). Piemonte’s Barbaresco appellation was created as a DOC in 1966 (just one year before the vintage of the Gaja bottle that we are reviewing) and was promoted to DOCG status in 1980. The Barbaresco appellation is reserved to red wines made from 100% Nebbiolo grapes grown in the territory adjacent to the towns of Barbaresco, Neive, Treiso and the village of San Rocco Senodelvio, all in the Cuneo district. The Barbaresco DOCG regulations require that Barbaresco base wines be aged for at least 26 months, at least 9 months of which in wooden barrels, whilst Barbaresco Riserva wines be aged for at least 50 months, at least 9 months of which in wooden barrels. Gaja is one of the heavyweights in the high-end segment of Italian wine, so much so that Angelo Gaja (the man that has been running this powerhouse winery since 1961) has been described by the LA Times as “the undisputed King of Barbaresco“. He is best known for certain of Gaja’s signature labels, most of which revolve around the Nebbiolo variety, from the 100% Nebbiolo “Barbaresco DOCG” (such as the one that we are reviewing) to certain experimental Nebbiolo-Barbera blends that Angelo Gaja created under the looser rules of the “Langhe Nebbiolo DOC” appelation, which for its wines only requires the use of 85% or more of Nebbiolo grapes (unlike the Barbaresco DOCG appellation which requires 100%). These blends include the single-vineyard “Langhe Nebbiolo Sorì Tildin DOC” (95% Nebbiolo, 5% Barbera), “Langhe Nebbiolo Sorì San Lorenzo DOC” (95% Nebbiolo, 5% Barbera), “Langhe Nebbiolo Costa Russi DOC” (95% Nebbiolo, 5% Barbera), and “Langhe Nebbiolo Sperss DOC” (94% Nebbiolo, 6% Barbera). 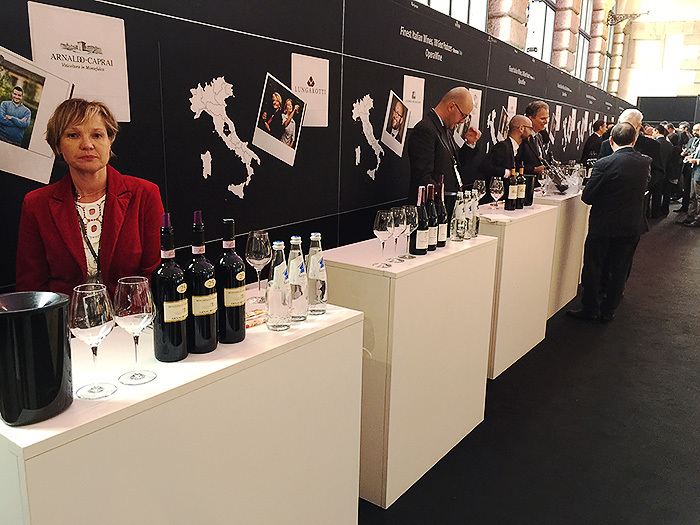 Retail prices for Gaja reds range from about $150 to $400 and more. The Gaja lineup also comprises a few white wines made from international varieties, such as coveted “Langhe Chardonnay Gaia & Rey DOC” (100% Chardonnay) and “Langhe Sauvignon Alteni di Brassica DOC” (100% Sauvignon Blanc). The Gaja estate was founded in 1859 by Angelo Gaja’s great-grandfather Giovanni Gaja and has stayed within the Gaja family ever since. Nowadays, it encompasses 92 HA of vineyards in the areas adjacent to the town of Barbaresco in Piemonte’s Cuneo district. Total annual production is about 350,000 bottles. Those bottles of the wine that we are going to review, Gaja, Barbaresco DOC 1967, that are still available in the US retail for about $300. Gaja’s 1967 Barbaresco was 13.2% ABV and was made from 100% Nebbiolo grapes. In the glass, the wine was rusty red and viscous. On the nose, it was intense, complex and fine with aromas of ripe cherry, dried roses, sweet tobacco, cigar box, cocoa, soil, forest floor and mineral hints. In the mouth, the wine was dry, with high ABV and smooth; it was moderately acidic, tannic, tasty. It was full-bodied and balanced, with intense and fine flavors of spirited tart cherry, rhubarb, and hints of blood orange. It had a long finish and its evolutionary state was mature.